Value: It is the most mysterious place in the city. Name Origin: A soldier reported to the Emperor Paul I about the vision that occurred at the future site of the castle. Archangel Michael appeared to him and ordered him to build a church here. Believing in mysticism, Paul I immediately ordered to start working. However, he interpreted the words of the angel in his own way and built here the residence with a church in honor of St. Michael inside. Paul ruled the country for 4 years, 4 months and 4 days. He was killed in the Saint Michael’s Castle, where he lived only 40 days. On the facade of the castle, you can find a distorted biblical quote: “To your house befits the sanctuary of the Lord in the longitude of days”. This inscription consists of 47 letters, and Paul was killed when he was 47. After the death of Paul I, the building was given to the engineering college. Here studied Feodor Dostoevsky. The most famous ghost of St. Petersburg is claimed to live in this castle. A sad shadow of the emperor playing the flageolet (an instrument resembling a flute), was seen in XIX century, and sometimes it can be seen even today. However, the museum staff noticed that the first sounds of music are enough to tell: “Hello, Your Majesty,” – and the ghost fades away. The color of the castle is said to be of the gloves of Paul’s favorite. She seemed to drop her glove at the ball. 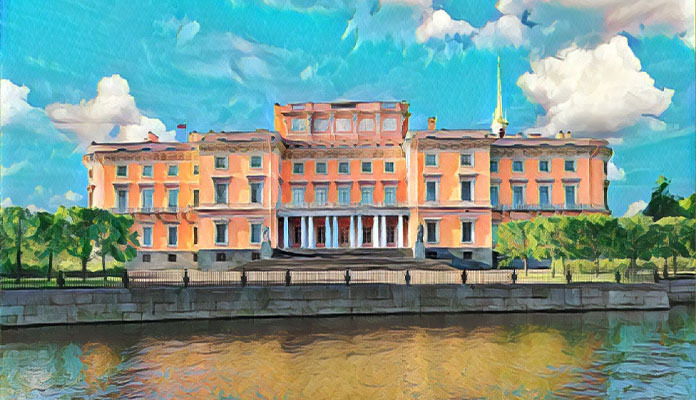 The chivalrous emperor raised the glove but did not return it to her, but gave to the architect V. Brenna, who painted the residence in this unusual for St. Petersburg color. About Museum: In this building, the branch of the Russian Museum is located. In several restored parade halls, paintings and tapestries created in the 18th-19th centuries Russia are exhibited. However, the most attractive object – the bedroom where Paul I was killed, is not recreated. The strict and cold decor of the halls does not produce the impression of luxury, and the effect of mystical mood can happen only to very emotional people. Opening hours: 10am-6pm, Thu – 1pm-9pm. Day off: Tue. Tickets: adults – 300 rubles, students – 150 rubles, children under 16 – free of charge.